The Government of Malawi provides only some information to the public on the government’s national budget and financial activities, according to the 2012 Open Budget Surveys that are used to track the state of budgetary transparency and participation. Malawi’s score has improved over the last four years. However, limited access to information makes it difficult for citizen’s to hold the government accountable for its use of public money, argues the International Budget Partnership, the organisation behind the index. Improvements are necessary if citizens are to ensure that the government’s management of royalties, taxes and other payments from mining companies are invested wisely. Malawi is yet to produce a “citizens’ budget” which would help bridge the gap between decision-makers and the people who voted them into power. This type of budget is conceived to be a citizen-friendly, non-technical document that allows the public to better understand how the government intends to raise and spend revenue and public funds in order to achieve goals set out in the Malawi Growth and Development Strategy II and the Economic Recovery Plan, for example. Simply publishing documents relating to the budget is not enough and does not necessarily improve governance. To maximise the benefits of open budgeting, public participation in budgeting processes is essential and opportunities for participation in the national budget cycle can be provided by the executive, legislature, and the National Audit Office. 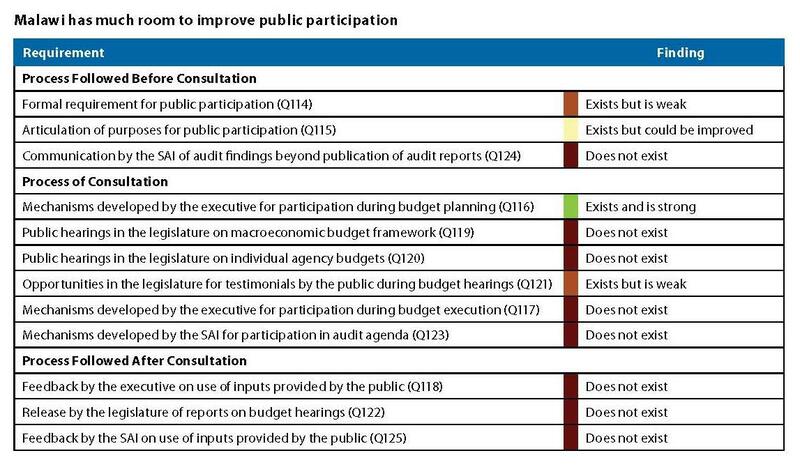 Unfortunately, public participation in the national budget decision-making process is very limited in Malawi, as evident in the table below. This is also indicative of other sectors, including the extractive industries. Malawi’s score, 52 out of 100, is higher than the average of 43 for the 100 countries surveyed and the country falls average in the region. It beats its neighbours, Mozambique and Zambia, which scored a reasonable 47 and a dismal 4, respectively. The Open Budget Survey assesses whether a country’s central government makes eight key budget documents available to the public. These documents are listed below with Malawi’s current status. 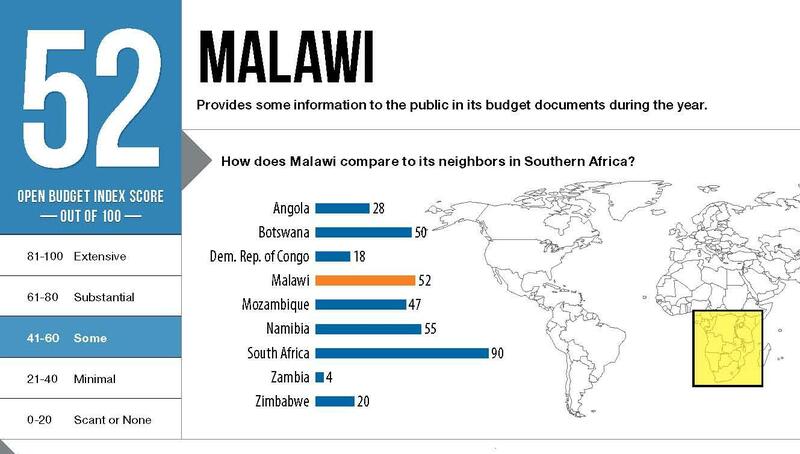 For a detailed overview of recommendations, look at the Open Budget Survey’s profile for Malawi. Pre Budget Statement: This usually provides information linking government policies and budgets and presents the broad parameters that will be used to define the budget proposal presented to the legislature. This is not produced in Malawi. Executive’s Budget Proposal: This includes the government plans to raise revenues and how it will spend monies from taxation and other sources in order to support its priorities, which helps to transform policy goals into action. This is published in Malawi but requires more in-depth information. Enacted Budget: This is a legal instrument used to authorise the executive to raise revenues, make expenditures, and incur debt. This is published in Malawi. achieve policy goals. This is not produced. comparisons with the budget figures and adjustments. These are published in Malawi. Mid-Year Review: The review outlines the budget’s effects at the midpoint of a budget year and introduces any changes in economic assumptions that affect approved budget policies. This is published in Malawi but requires increased comprehensiveness. Year-End Report: The report includes a comparison of the actual budget execution relative to the Enacted Budget. This is produced for internal use only. whether the executive has raised revenues and spent monies in line with the authorized budget, and whether the government’s accounts. This is published in Malawi but requires increase comprehensiveness. In Malawi, research to complete the country’s Open Budget Survey was undertaken by Dalitso Kubalasa, of the Malawi Economic Justice Network (MEJN). The International Budget Partnership’s repeated attempts to get comments from the Malawian government on the draft Open Budget Questionnaire results were not successful. Hopefully, this is not indicative of the current administration’s interest in the state of transparency and public participation in raising revenue and spending public money. The Open Budget Survey is a fact-based research instrument that uses easily observable phenomena to assess what occurs in practice. The research conclusions are typically supported by citations and comments, including reference to a budget document, a law, or other public document; a public statement by a government official; or comments from a face-to-face interview with a government official or other knowledgeable party. The Survey is compiled from a questionnaire completed for each country by independent budget experts who are not associated with the national government. Each country’s questionnaire is then independently reviewed by two anonymous experts who also have no association with government. In addition, the IBP invites national governments to comment on the draft results from the Survey and considers these comments before finalizing the Survey results. The entire research process for 2012 took over 18 months between July 2011 and December 2012 and involved approximately 400 experts.